In 2011, I purchased a shiny new Galaxy SII smartphone, and almost immediately rooted it (hacked it) , to put a custom ROM on it that was more beautiful than any Android interface I had ever seen, called Miui. It's smooth, beautiful interface was a truly unique design that was ahead of it's time. The fully customizable interface allowed for you to apply an endless supply of themes or skins to it, allowing you to completely change the look of your phone whenever you wanted. I changed mine almost every day. And the skins were gorgeous, especially those with the unique, FLAT design that we would later see deployed by other manufacturers years later. I knew I loved the interface, and I knew how revolutionary it was. What I didn't know, was how to pronounce the name of it's creator, Xiaomi. At the time, Xiaomi was literally an unknown outside of the Android hacker community. They were a little known Chinese company with nothing more than a free custom Android interface that rocked. We had no idea, what they become. In 2010 it was an unknown, in 2014, it became the world's the world’s most valuable technology start-up after it received $1.1 billion funding from investors, making Xiaomi's valuation more than $46 billion. Yeah, $46 Billion. And MANY people outside of China still don't know the name. As of January 2015, Xiaomi is the world's 3rd largest smartphone distributor, followed by #4 Lenovo, and 5th place LG, with Samsung still in the #1 slot and Apple at #2. 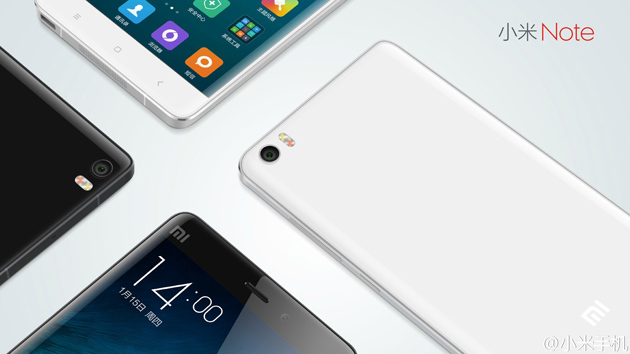 Xiaomi designs, develops, and sells smartphones, mobile apps, and consumer electronics. Xiaomi is on every tech manufacturer's radar, because they are not just a threat in the smartphone arena, they also make products like LED Lightbulbs, Streaming media players, smart remotes, webcams, 3D TV's, headphones and even a Humidifier. And Xiaomi shows no signs of stopping. 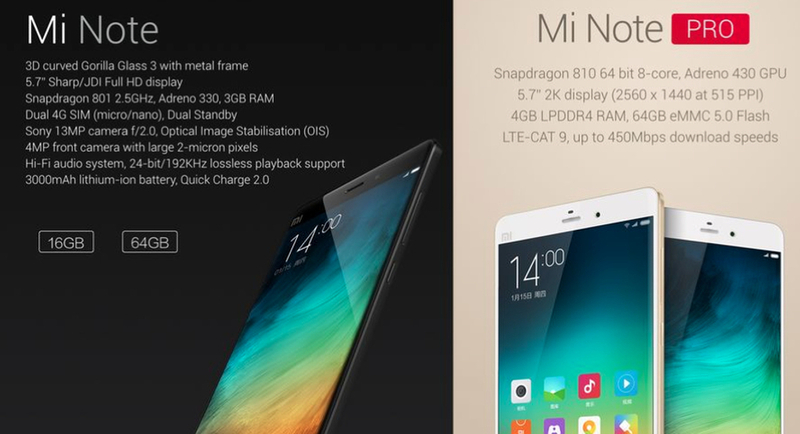 Xiaomi announced yesterday a new flagship mobile phone, the Mi Note. The Mi Note is a 6.95mm-thick smartphone with a 5.7-inch 1080p display, a 13-megapixel camera, options for a Snapdragon 801 processor, 3GB of RAM, a 3000 mAh battery, and curved glass on both the front and back panels; the company refers to the front glass as "2.5D" and the rear glass as "3D." All of this hardware, lighter & thinner than an iPhone 6 Plus (It's size/performance competitor), and just as beautiful. And the price of entry? $370, OFF CONTRACT for the 16GB version, and $450 for the 64GB version. There will even be a "Pro" model, boasting 4GB of RAM, a Snapdragon 810 processor, and a 1440p display for 3,299 yuan (about $520). For comparison, the iPhone 6 Plus off contract costs $749 for the 16GB unit and $849 for the 64GB variant. If you look at the math, that puts the the 16GB variant under HALF the costs of Apple's offering, and the 64GB version just over half. Did I mention that the Mi Note also packs in High Definition Audio? Yeah. Sony just released a Walkman last week that Runs $1,200 for the same Audio Playback Quality. It bears mentioning, that there are a ton of Chinese companies making knockoff products or inexpensive small electronics devices for virtually everything. Where Xiaomi differentiates itself though, is the Quality and performance of their products considering the low prices. Impressions from reviewers are frequently favorable, noting the quality of the build and the surprising performance of Xiaomi products. And it took 4 years to get here. 4 years. Apple, Samsung, LG, Lenovo, all of these companies took over a decade to establish themselves as serious players. And Xiaomi has managed to join their club in less than half that time.